In 2017, we celebrated our 60th Anniversary and implemented a new giving level called Diamond Paws. This is for individuals/families that contribute $1,957 (or more) in a calendar year. 1957 represents our founding year. For our inaugural campaign, we were fortunate to have 70 donors! Thank you to everyone for your support. Hanging on the wall by our entrance, and also at our Rehoboth Center, is a beautiful display listing the 2017 members. Each year we will post the Diamond Paws donors for the previous year in this way. 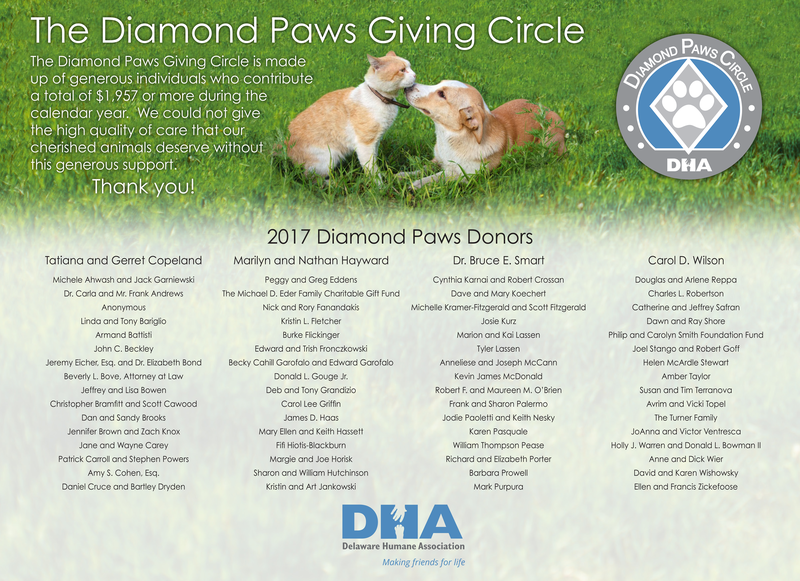 Diamond Paws donors are invited to a special thank you event each year and also receive a lapel pin commemorating their membership. If you would like to be a Diamond Paws donor, you can make a pledge now, and pay throughout the year or in-full if desired. A match from your employer will count toward your Diamond Paws donation, so you don’t necessarily need to pay the full amount. For more information, please contact Greg Munson, Director of Community Engagement, 302-571-8171 x 312 or email gmunson@delawarehumane.org. With your help, our cats and dogs will continue to receive wonderful care, necessary medical treatment, and lots of love and attention while they await their forever home.